The singer's funeral was held in her home town in Co Limerick, Ireland. 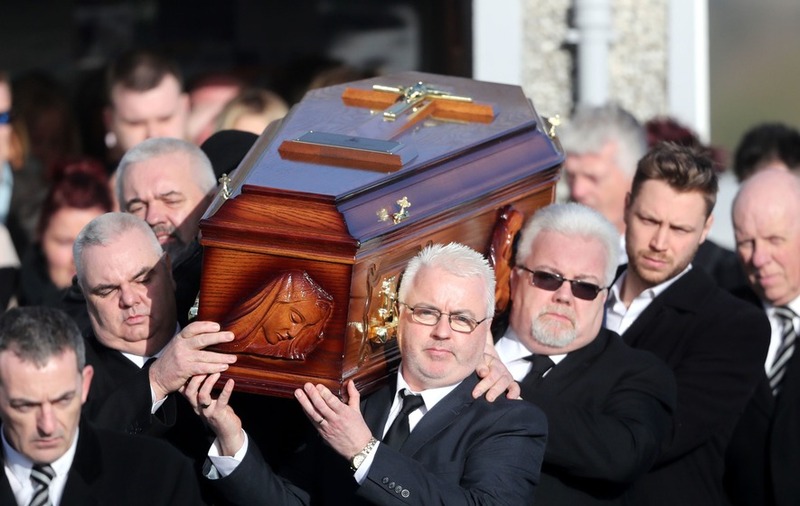 Cranberries singer Dolores O’Riordan had a loving heart, a voice of gold and starred in the gig of life itself, mourners at her funeral have heard. O’Riordan’s distinctive voice, described during the mass as unique, far reaching and distinctly Irish, filled the Church of Saint Ailbe in Ballybricken at the outset, as her duet of Ave Maria with Luciano Pavarotti was played. In his homily, family friend Canon Liam McNamara said O’Riordan’s voice was worth its weight in gold. “Her kind personality and beautiful singing voice earned for her numerous admirers,” he said. “It must be added that the numbers she rescued from the darkness of depression are impossible to count. The artist’s mother Eileen, sister Angela and brothers Terence, Brendan, Donal, Joseph and PJ comforted each other in the small parish church. At the outset of the mass, symbols associated with O’Riordan’s life were brought to the altar. Mourners then paused for a moment’s silence and a prayer before her sister Angela read a passage of scripture. In a service with a strong family focus, a number of O’Riordan’s nieces, nephews and godchildren played roles. He recalled meeting the young O’Riordan in 1989 when she was singing and playing the keyboard in the church. He added: “She did have an unique respect for everybody. “Now she is singing in the heavenly choir – hymns of petition for us,” he said. Canon McNamara said O’Riordan had been reunited with loved ones in heaven, including her late father Terry. “If tears are shed in heaven – by necessity they are tears of joy,” he said. During communion, O’Riordan’s haunting version of the hymn Panis Angelicus was played in the church. Archbishop of Cashel and Emly Kieran O’Reilly hailed her one of a kind voice. “Since we heard of the sudden death of Dolores O’Riordan, many hearts in Ireland and around the world are heavy with sadness on hearing the news,” he said. “Indeed, the great outpouring of sympathy and love for Dolores which we have seen since her death is a witness and a tribute to her great musical talent and very special voice by her many fans and lovers of music. “Her singing voice was unique, far-reaching and distinctly Irish. “In an interview after meeting the now Saint Pope John Paul II, Dolores stated that her faith was one of her greatest musical influences. At the close of the service, the Cranberries song When You Are Gone rang around the church as the singer’s remains were brought to the nearby graveyard for a private burial service. Sales and streams of The Cranberries’ back catalogue rocketed by 1,000% in the days since her death.